Ah, Italy. There’s nowhere else on earth quite like it. The boot-shaped country’s 20 regions are as varied as their landscapes, cuisine, and architecture. But one quality remains consistent. Italy is beautiful. Italy is about beautiful food, beautiful buildings, beautiful art, and a beautiful way of life. It’s the land of philosophers and sculptors, of fragrant lemon groves and rolling vineyards. It’s where friends linger over cocktails and dinner is considered a several-hour event. And it’s a destination travelers return to again and again, because you really can’t absorb all the country’s beauty in one trip. Even if you could, as soon as you leave Italy, you begin daydreaming about your return. Fortunately, there’s countless things to see and do in Italy, whether it’s your first trip or your fiftieth. To help spark some ideas for your next Italian journey or country-intensive voyage with us, here are seven of the best things to do onshore. Food is an integral part of Italian culture. Immersing yourself in the country is more than just eating (though you’ll do plenty of that). It’s about understanding the philosophy behind the cuisine. So, one of the best parts of visiting Italy is indulging in everything from classic dishes to decadent desserts. Italian food isn’t overcomplicated. It’s about simple, powerful flavors that come from using only the best and the freshest ingredients. And it’s about tradition and family, honoring recipes that have been perfected and passed down throughout generations. A Food & Wine Local Immersions shore excursion is a great way to get to know authentic Italian cuisine (and maybe even learn a new cooking skill). Seasonality is also integral to Italian cuisine, which means that the food you eat during your vacation is influenced by the time of year. Plus, it’s influenced by the region, as local food is more than just a movement in Italy: It’s a way of life. 2. Embrace La Dolce Vita. When you travel to Italy, you should live as the Italians do. And that means embracing la dolce vita. La dolce vita translates to “the sweet life” — and Italians truly know how to make life sweet. Here are a few ways you can embrace it during your cruise. Italians love coffee, and they do it better than almost anyone else. So, when you’re in Italy, use phrases like “un caffè, per favore”. Order your coffee and stand while you drink it (most cafes charge almost triple if you sit at a table). Drink slowly, but don’t linger. It should only take a few minutes to enjoy an espresso. If you want milk, order a caffè latte (espresso with hot milk) or a cappuccino (espresso and steamed milk with foam). Keep in mind, though, that Italians only take milk with their coffees in the morning. If you want to experience authentic Italian coffee culture, then order a cappuccino, but do it before 10:00 a.m. In the afternoon and evening, it’s common practice to only have espresso, as Italians believe hot milk after a meal will disrupt the digestion process. The idea of aperitivo is simple: sit down to have a social drink and, most likely, a complimentary snack before dinner. It’s a more sophisticated “happy hour”, with a focus on socializing rather than getting a deal. It’s also the perfect chance for an intrepid traveler to take a break from sightseeing. If the weather permits, choose a table outdoors. Order a Negroni, Aperol Spritz, or a glass of wine. Watch as the world goes by, marvel at how fashionable Italian women can navigate cobblestone streets in stiletto heels, or fill a few pages in your travel journal. La passeggiatta is the Italian tradition of walking or, to be more exact, strolling. It’s an evening promenade of sorts, taken as day turns into dusk, and marking the end of the workday (usually anytime between 5:00 p.m. and 8:00 p.m.) On weekends, the passeggiatta is an opportunity to spend time with family and to dress to impress. It’s about seeing friends and neighbors, sharing gossip, and getting a little fresh air before dinner. For travelers, the passeggiatta, is simply an enjoyable way to do a little sightseeing and fit in with the locals. Rather than rushing from one landmark to the next, take your time strolling down a main avenue and observing your surroundings. Like coffee, dinner in Italy is an art. For most Italians, lunch is the heaviest meal of the day. However, a dinner out is considered a social event. It should begin late and last hours. The food is important, but so is the conversation. A full Italian meal consists of five courses. It starts with antipasti (appetizers). Primo, the first course, is pasta, soup, or risotto. Secondo, the second course, is usually meat, poultry, or fish. Most people will also order contorni (a side dish) or insalata (salad). Finally there is, dolce (dessert), which could be pastry, fruit, or cheese. After dessert, it’s common to drink an espresso or digestivo — a small glass of grappa, limoncello, or other liqueur meant to ease digestion. 3. Go for a coastal drive. One of the most relaxing and heavenly destinations in Italy is the Amalfi Coast. The picturesque cliffside villages and rocky beaches dotted with colorful umbrellas make it a sunny haven popular with international travelers and Italian vacationers alike. And there’s no better way to experience it all than by driving along the coast. The winding, narrow roads can be harrowing for an inexperienced driver, but are a delight for passengers. Want to hit the road? Here are some towns and villages along the Amalfi Coast that are definitely worth more than “a pit stop”. Sorrento is considered the start of the Amalfi Coast and makes a great jumping off point for touring the area. It’s also a larger town that’s worth exploring on its own, and an easy access point for day trips to Naples or Pompeii. After Sorrento, Amalfi is the largest town along the Coast. It’s steeped in history, surrounded by lemon trees, and home to numerous beaches, lively restaurants, and a striking cathedral. Often overlooked, Praiano is one of the smaller villages along the Amalfi Coast. Pay it a visit, though, and you won’t be disappointed, since it boasts splendid views, a sunny beach, and lots of hiking trails. Though smaller than Amalfi, Positano is a trendier stop along the Amalfi Coast. It’s widely regarded as being the most picturesque of the villages, with steep hills and pastel-colored houses. This clifftop town overlooks the sea, but a lack of beach access makes it less popular with vacationers seeking sunbathing opportunities. It’s a quieter, more tranquil hamlet known for its beautiful gardens. With more UNESCO World Heritage Sites than any other country on earth, Italy is made for history buffs — and some of the most impressive ancient ruins and historic buildings can be found in the capital city of Rome. From its early beginnings in 753 BC, Rome grew to become a powerful empire and at its peak, the Roman Empire encompassed most of continental Europe. Today, you can get a sense of what life was like during this illustrious period by exploring such renowned sites as the Roman Colosseum, the Roman Forum, Palatine Hill, and the Pantheon. But if this is a return visit to Rome, you may want to venture off the beaten track and go to a lesser-known site. Not far from the Colosseum is the Baths of Caracalla, famed for being some of most incredible ruins in The Eternal City. The complex of baths belonged to the Emperor Caracalla and dates back to 216 AD. There are also the Catacombs of San Sebastiano, where magnificent frescoes and mausoleums await. Beyond Rome, seemingly every Italian city and town has something to offer history lovers. Taormina is a highlight thanks to its well-preserved ancient Greek Theatre. Ravenna will impress with its stunning collection of Byzantine art and mosaics. And when it comes to ancient ruins, there’s perhaps no more impressive site than Pompeii. The ancient town was buried in ash for centuries, after the devastating eruption of Mount Vesuvius in 79 AD. However, excavation work has been ongoing for centuries and archaeological discoveries continue, making every trip back to Pompeii new and interesting. An exploration of Florence’s history will lead you to the Medici Family. The family gained their power through banking and politics in the 15th century, and was among the wealthiest in Europe at the time. In 1531, the family became hereditary dukes of Florence and, a few decades later, grand dukes of Tuscany. Follow in the footsteps of the influential family and visit Palazzo Pitti and the adjacent Boboli Gardens, Palazzo Medici-Riccardi, the Medici Chapels, and the Basilica of San Lorenzo. 5. Sample fine Italian wines. Italy is one of the world’s best travel destinations for wine lovers, and a country-intensive voyage is the perfect opportunity to indulge in some sensational sampling. When you join an Azamara shore excursion, all the plans are handled for you. There’s no need to worry about directions, driving, or details. You just sip and unwind with your wine! In ports all across Italy, you can visit local wineries and vineyards to learn about what makes that region’s wines special. Often, you can even opt to join our ship’s sommelier for a guided walk or winery visit, before enjoying dinner back onboard the ship with wine pairings. Wine from the Chianti region in Tuscany was once best known for its short, wide bottles encased in straw baskets. However, most Chianti today is bottled in a traditional manner. A Chianti wine must be produced in the region of that name, with at least 80% Sangiovese grapes. Chianti wines are often referred to as “perfect food wines” and pair well with Italian dishes like pizza, pasta, or Tuscany’s famous Florentine steak. Brunello and Barolo wines are often in contention for the title of “best Italian wine” (if one can name such a thing). Brunello di Montalcino is produced in the region surrounding the Tuscan town of Montalcino. Made with 100% Sangiovese grapes, it has a deep color, moderate tannins, and pairs well with red meat and tomato-based dishes. Barolo wine is produced in the northern region of Piedmont. Barolo is made with 100% Nebbiolo grapes, and is lighter in color than Brunello wine. Barolo wine tends to be high in tannins and quite acidic, but gets smoother over time. (It’s often recommended a Barolo wine should be aged 10 years before drinking.) It pairs well with meat, mushrooms, truffles, and pasta. Barbaresco is very similar to Barolo wine, as it’s also produced in the Piedmont region with Nebbiolo grapes. However, the soil of Barbaresco differs from the soil of Barolo, and produces less tannins. This wine pairs well with meat, mushrooms, truffles, and pastas. After Sangiovese, the Montepulciano grape is the second-most planted in Italy. It’s traditionally been an inexpensive red wine that pairs well with food, but has recently gained acclaim in the Abruzzo region. Montepulciano d’Abruzzo wines are typically dry, soft in tannins, and do not need much aging. Pro tip: Don’t confuse Montepulciano d’Abruzzo with Vino Nobile di Montepulciano. The latter is a Sangiovese wine named for the Tuscan town of Montepulciano, not the grape. It’s a confusing, but important difference. 6. Immerse yourself in incredible art. Italy is an ideal travel destination for wine aficionados, for history buffs, for foodies...and for art lovers. In fact, the Italian city of Florence just might be the greatest city in the world for art enthusiasts. The birthplace of the Renaissance is home to two exceptional galleries, as well as plenty of fantastic outdoor public art. Travelers shouldn’t miss visiting Michelangelo’s David at the Galleria dell’Accademia, or checking out the world’s largest collection of Renaissance art at the Uffizi Gallery. Rome also packs an artistic punch. The Vatican Museums are home to the must-see Sistine Chapel by Michelangelo and a collection of roughly 70,000 works of art — though only 20,000 are on display (if you can call 20,000 works of art “only”). There’s also the Borghese Gallery, renowned for its many sculptures, paintings, and mosaics, as well as the sculpture of Daphne and Apollo by famed artist Bernini. Visits are by appointment only, which limits the number of visitors allowed in every two hours and makes for a more intimate viewing experience. 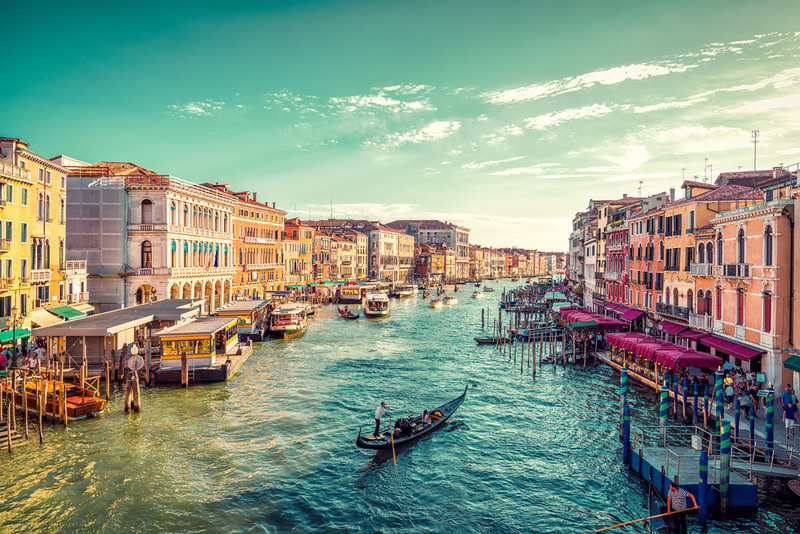 In Venice, art lovers should head for Piazza San Marco. From there, you can see the stunning interiors of Saint Mark’s Basilica and Doge’s Palace, in addition to the Museo Correr. The museum houses an impressive collection of art that was bequeathed to the city of Venice in 1830 by Teodoro Correr. Correr spent his life meticulously collecting art and artifacts relating to the history of Venice. 7. Go off the beaten path. One of the great joys of an Azamara country-intensive voyage is having the time to venture a little off the beaten path. During these voyages, you can explore lesser-known neighborhoods in Italy’s major cities, and call on smaller Italian ports you may not have visited otherwise—like the port of Olbia. Located on the Italian island of Sardinia, Olbia means “happy town”, and you’re bound to feel happy when you stop onshore. It’s a gateway to the Costa Smeralda (or “Emerald Coast”) of the island, where beautiful beaches and hip restaurants await. There’s also the port of Brindisi, considered a great jumping-off point to explore Italy’s Puglia region. Pay a visit to the town of Lecce, a highlight of the area. The excellent local food, Baroque architecture, and impressive Roman amphitheater are sure to win you over. In Rome, consider forgoing the main attractions – especially if you’ve already been – and venture to some of the city’s lesser-known neighborhoods. Trastevere, Testaccio, and the Jewish Quarter are just three areas to consider. Wherever you go in Italy, it will be a joy — especially when you go with Azamara. Our mid-sized ships are like boutique hotels that float, transporting you from one great destination to the next in style. Just imagine a week or more exploring the spectacular cities and remarkable regions of Italy, and only having to unpack once! Browse our Italian itineraries and country-intensive voyages here. Port Collectors: Real or Legend?